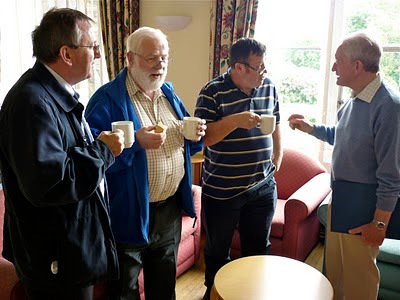 Last Fri. (June 18th) I travelled up to Leeds for a day's meetings, sharing + fraternity with 12 Brothers from other congregations in Britain + Ireland on the topic of "Sharing Our Prophetic Vision". I am on the 3 Brother working party (a De La Salle Brother, a John Of God Brother and me) that organised the day and in the afternoon I gave a presentation (+ led a discussion) on "Internet + Evangelisation". This day followed on conveniently from a more high-profile conference in London 2 days earlier for those involved in vocations ministry from both female and male religious congregations and institutes, entitled "Surveying The Catholic Future". So England live to fight another day and I'm delighted for them, but especially for the man who has come under even more pressure this week than Robert Green did after his flappy hands against the US - Fabio Capello. I'm a big Capello fan myself. People forget it is his first tournament ever as a national coach. He's never been away with a team like this before and it looks like he is learning as he goes along that his strict "Headmaster" routine won't get the best out of the players when away with them for such a long time and that a more "6th form tutor"-like approach (the players drank beer last night!!??) will work far better. After the entertaining tv science documentary series "Into The Universe With Stephen Hawking" on Discovery in the UK (and other channels worldwide), the US is starting to show "Through The Wormhole" a.k.a "Into The Universe With Morgan Freeman". Morgan Freeman? Turns out he is a space enthusiast and co-producer of the series. This first episode looks at the origins of the universe in relation to the God question. I'm hoping that this will be shown in the UK soon (probably on Discovery Science). Sponsored cycle: Southampton - Berlin. The photos - part 2. 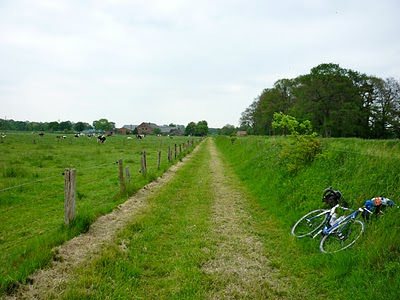 Day 5 - The cycle paths through Belgium, Holland and Germany were on the whole nicely tarmaced, clearly indicated and a pleasure to ride. There were a few exceptions, however... This was indicated as a cycle path!! Having arrived at Gerleve Benedictine monastery: the cloister. I came back from Compline (the last prayer time of the day for the monks) to find this most welcome bottle of beer at my door with a glass + bottle opener. Nice touch. Day 6 - Leaving Gerleve the next morning. Camera on timer. More sun, right from the word go at 7am. Here I just liked the lines created by the trees and the road together. The cycle path is in the shadows on the left. It was the feast of Corpus Christi. I crossed a procession to the church here in this town, Telgte, as I left this square. Approaching Porta Westfalica, a famous pass between 2 large hills/small mountains that acts as a gateway into the next region, Westfalia. From Evernote:Clipped from: http://www.universetoday.com/2010/06/12/astronomy-without-a-telescope-is-time-real/ Time is an illusion caused by the passage of history (Douglas Adams 1952-2001). Sponsored cycle: Southampton - Berlin. The photos - part 1. Here's a first bunch of photos from the ride. Fr. Vic McClean, parish priest at Goudhurst, Kent, with whom I stayed the first night. Had never met him before but discovered that we had many common interests (music - both musicians, film, etc...) and that both our fathers were butchers! Day 2 - Staying with my friends Christian + Marie-Brigitte Frère at Wailly-Beaucamp, south of Boulogne-sur-mer in N. France. Day 3 - Leaving the Frères' farmhouse. A disused mine, heading towards the Belgian border. A famous stretch of cobbles (not on my route) going through the Arenburg forest that is used in the Paris-Roubaix one day cycle race, one of the most famous professional cycle races after the Tour de France. Fr. Pierre (right) and Br. Bruno (left), both Salesians, at their children's home Le Hornu, near Boussu, Belgium. Day 4 - More cobbles, this time in Belgium. These I had to ride over. Today at the Brandenburg Gate. Well, I have made it to Berlin. 859 miles, 1 broken spoke, no punctures, a few rattles and chipped chainring teeth, lots of sunburn, countless cereal bars, energy drinks, bananas, bottles drinking yoghurt and 8 days later. 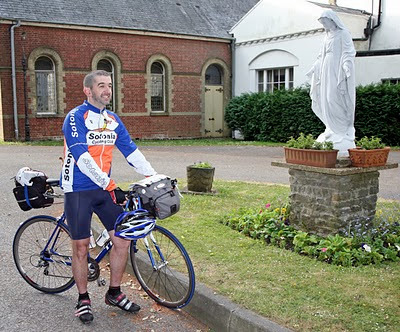 Longest day = 137 miles, shortest = 80 (the day of the Dover-Boulogne channel crossing). I`m staying in a Franciscan community in the former Communist-controlled East Berlin, having stayed with Benedictines, Salesians, Brothers of the Immaculate Conception, a parish priest, a diocesan conference centre and lay friends on the way here. See the attached photo for a proud cyclist arriving at the Brandenburg Gate this afternoon. Don`t forget, all of this will be in vain if I don´t get that sponsorship coming in for our schools in Haiti, most of whom are currently having to function with tents for classrooms! !